Three Ways to Engage – Xemobi Inc. The image below shows how the various campaigns compare in terms of relevance and reach. The physical proximity of a customer to a product or brand is one of the best indicators of shopping intent. Target relevant offers at customers when are right next to a product or a brand using the power of proximity Beacons. We support both iBeacon and Eddystone beacon formats on iOS, Android and Mobile Web. Run location based Social Campaigns which are triggered when the customer enters or exists a pre-defined location. Our scalable geo-fencing dynamically configures based on customer location. Want to increase the relevance of your campaigns while at the same time increasing their reach? Our Contextual Social Campaigns achieves precisely that. Run Social Campaigns targeting customers based on their precise location in stores. Have them share or like any content on any social platform. 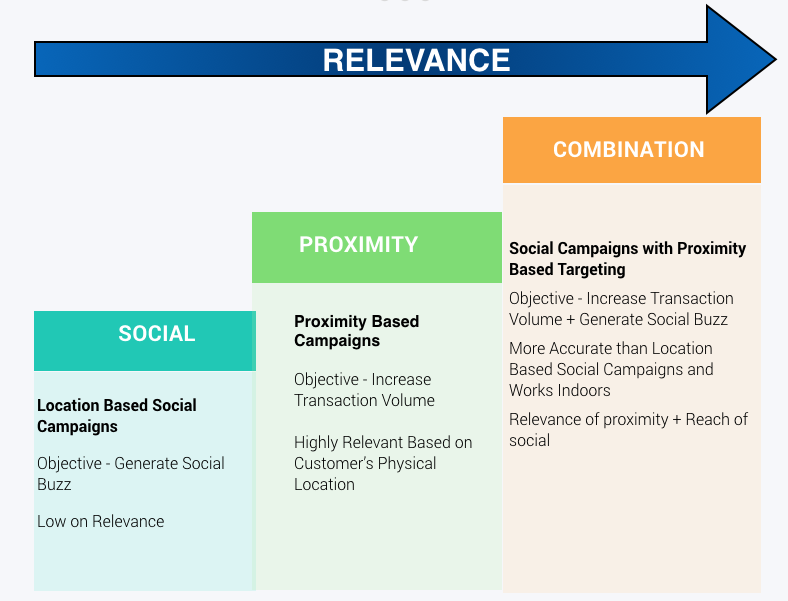 In the case of Social Campaigns, our analytics engine tracks these campaigns as they journey through various social platforms measuring the downstream impact of a customer engagement. Our learning algorithms use this information to generate more compelling campaigns and smarter targeting.